Chelsea ended Manchester City's unbeaten Premier League run with a 2-0 win at Stamford Bridge – a result that leaves Liverpool top. N'Golo Kante (45) stunned City by scoring with Chelsea's first attack before David Luiz - exposed against Tottenham two weeks ago - went from zero to hero by looping a header (78) into the top corner. The Blues become the first team to beat City in the league since Manchester United in April while Liverpool now lead the way by a point in the title race. Chelsea remain in fourth place following Tottenham's 2-0 win at Leicester but they have cut the gap to league leaders Liverpool to eight points. 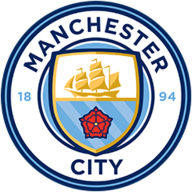 The first half was dominated by the visitors, who should have made their territorial dominance count on nine minutes but Raheem Sterling snatched at a close-range chance. Chelsea: Arrizabalaga (7), Azpilicueta (8), Rudiger (8), Luiz (8), Alonso (7), Jorginho (6), Kante (7), Kovacic (6), Pedro (6), Hazard (7), Willian (6). 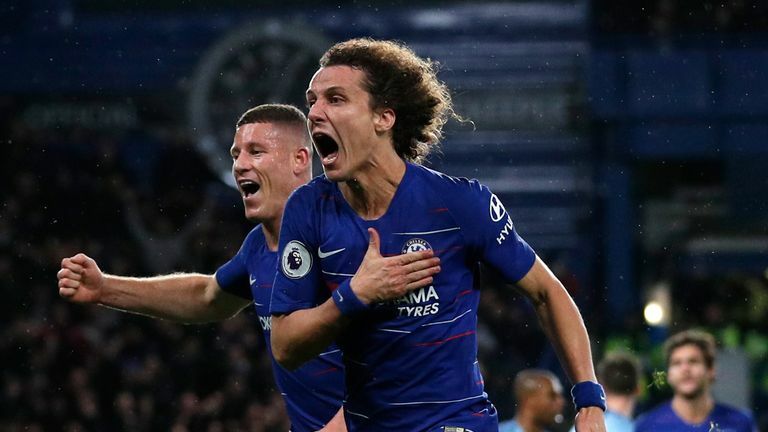 There was only one team conjuring up any attacking opportunities but Luiz, Antonio Rudiger and Cesar Azpilicueta stood firm against constant City probing. However, just as it looked a case of when rather than if City took the lead, Chelsea hit on the counter just before the break. Both teams decided to play without a recognised striker with Gabriel Jesus left on the bench for City while Chelsea went with a front three of Eden Hazard, Willian and Pedro. Luiz's long ball found Pedro, whose cross-field ball to Willian made City retreat into their own box. Willian found Hazard, who slid the ball back for Kante smash home from 15 yards. Ederson's only job of the half was to pick the ball out of his net. The goal triggered a surge in confidence for Chelsea, who were now able to handle City's high press and play into their midfield. City mustered little in response as Kyle Walker hit a speculative free-kick that summed up their frustrations. 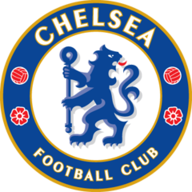 Chelsea remained organised in their shape and ended the game as a contest with the second goal. Hazard's corner was met by Luiz who sent a looping header into the far corner of the net. Anyone thinking of already handing the title to City, may have to think again. This type of game was made for the Chelsea skipper. His team had to do plenty of defending and he was in his element. First, keeping Sane relatively quiet before dealing with Sterling's threat in the second half. A key moment in the match was his last-ditch block to deny Sane a clear chance on goal in the first half. Mr Reliable delivered once again. Chelsea are unbeaten in 12 Premier League games at Stamford Bridge (W7 D5), their longest run without a league defeat on home soil since a 21-game streak ending in August 2015. Manchester City suffered their first Premier League defeat in 22 games, since a 2-3 defeat to Manchester United in April. Maurizio Sarri enjoyed his first-ever victory over Pep Guardiola, ending a run of three defeats against the Spaniard in all competitions (W1 L3). Kanté's opening goal came via Chelsea's first shot of the match in the 45th minute (44:02), the longest they have had to wait for a shot in a league game at Stamford Bridge since 2006-07. With four goal involvements in the Premier League this season in 16 games (2 goals, 2 assists), Kanté has already equalled his combined goal and assist tallies from his previous two top-flight seasons with Chelsea (2 goals, 2 assists in 69 games). "They beat us in one counter-attack and one set piece. We played the way we want to play. After that, when the opponent is good it's always to congratulate them, shake hands and improve for the next game." "We won today but we have to say that we were a bit lucky in the first 25 minutes because they could have scored. A little bit lucky in the first half and a very good second half. I think we have a team with some difficulties to be motivated. "In these kind of matches it's very easy to have very good motivation and the right level of determination and aggression, but during the season you have to play also with the small teams." City play Hoffenheim in their final Champions League group game in midweek while Chelsea travel to Hungary to play MOL Vidi in the Europa League.